Looking back, all the way back, to the 1890’s, where the first pictures remain of Wales International teams posing for their team group photo’s. It is evident from these black & white images that the national shirt colours were no one colour. The fact is they were not even Red! That’s right, the first kit ever to be worn by the Red Dragons squad was white and green half’s. This design and colour combination remained past the turn of the century, and it was not first recorded until 1905 that the Welsh International team donned the famous red, the colour sported as the first choice ever since. 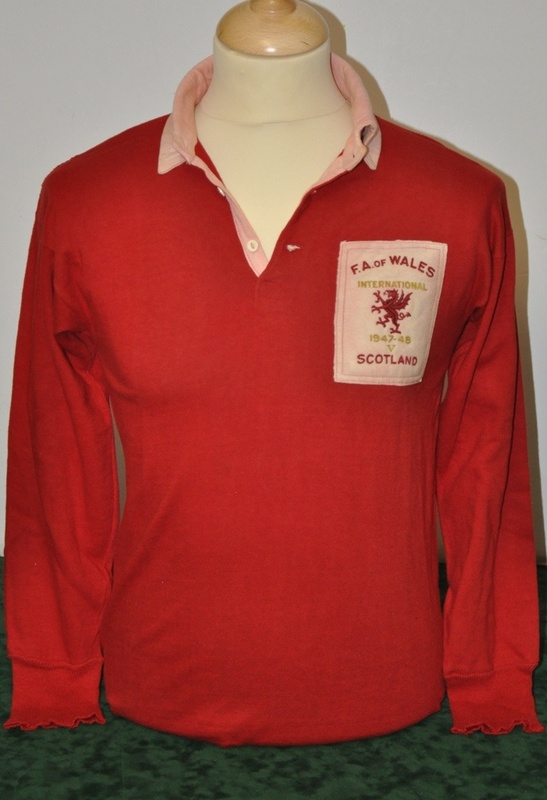 Up until the end of the Second World War, the Wales shirts were manufactured by a company called St.Margrets, a precursor to Marks & Spencer famous St.Michael clothing brand. Although many variations of the red shirt were worn between 1905 and 1946, they were mostly subtle differences on the theme of red shirts with a white trim, on a collar, cuffs, and the shield around national crest, which also tended to alternate quite a few times. Between 1906 and 1930 the shirt sported a lace up collar, but it became the fashion for the shirts to have a button up collar during the 1930’s, a trend which Welsh shirts followed from 1931. 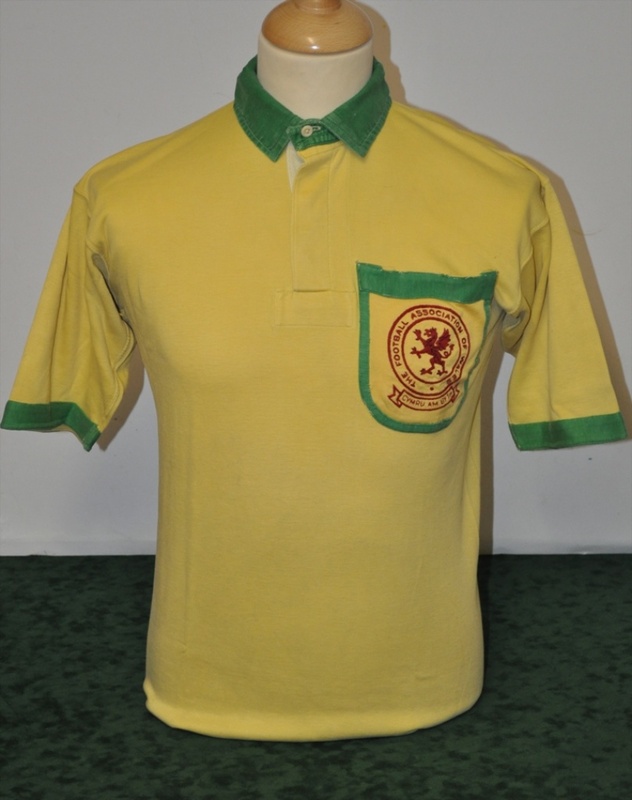 After the end of the Second World War, manufacture of the Welsh football kit was taken over by Umbro International, formerly known as Utility Clothing throughout the war years, due to them supplying clothing to the Armed Forces. Umbro’s first involvement with the FAW lasted until the end of 1974, although the kit was distributed by John Sharpe of Liverpool- but still made by the famous Cheshire brand- for a number of years during this time. The button up collar remained on the home shirt until 1956. The v-neck made fashionable by Sir Matt Busby’s “Babes”, was introduced in 1956 and following the fashions of the times became a round neck in 1963. 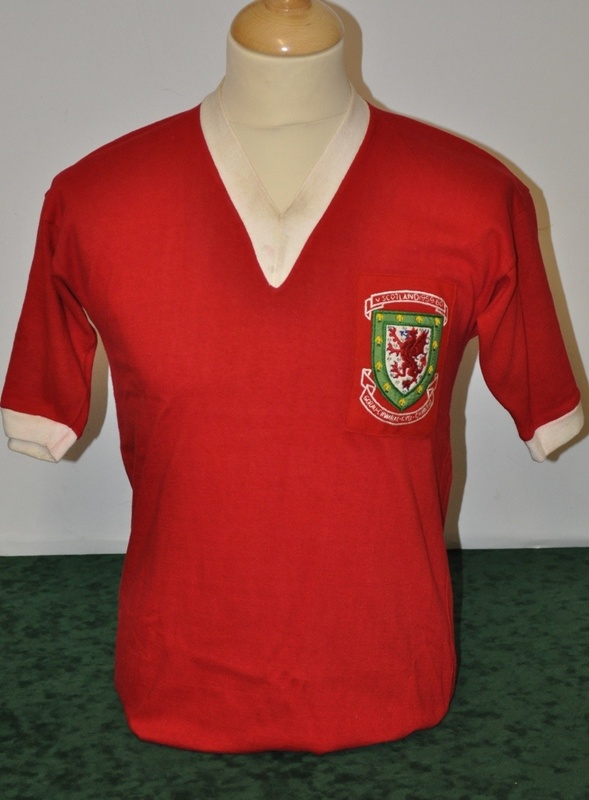 All these shirt styles had the white collar and cuff trim and it was not until 1967 that Wales first wore a completely red shirt with no white trim, but still had the round neck.